Raiders coach Tom Cable emphasized many times during the offseason his desire to see his team forge a more physical identity. The ability to convert in short yardage and be tough in the red zone offensively. The strength to stop opponents from doing the same to their defense. It’s really no different than what coaches say every year. The next time you hear a coach say he wants to be less physical and isn’t overly concerned about stopping the run will be the first. Except this time, the Raiders made personnel and schematic changes which indicate they were doing more than paying lip service to those goals. We’ll get an idea Sunday if they’re any closer to being the kind of team Cable desires, because the Tennessee Titans are an ideal opponent for testing their toughness and strength at the point of attack. 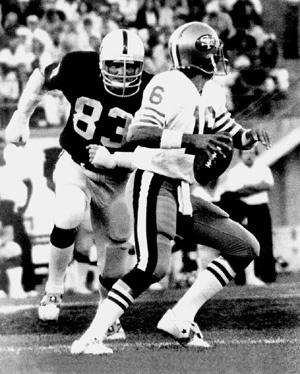 The Titans have a relatively anonymous defesnive front seven considered to be extremely active and strong, the kind of team which has often overwhelmed the Raiders in the past. Their offensive line is good enough so that Tennessee has thought nothing of continuing to run Chris Johnson, and do it successfully, even when opponents put eight or nine in the box. Why would the Raiders be better equipped to handle the Titans than in the past? Cable made some concessions in order to keep his job, and one of them was to loosen up on his strict adherence to zone blocking. He made no apologies for being an Alex Gibbs disciple and was firm in his convictions that if done correctly, zone blocking was not only the best system, but the only one. Zone blocking calls for linemen to be smaller and lighter, with the ability to cut block and rely on running backs to put their foot in the ground and look for an open back side. The Raiders still have zone blocking in their tool box, but have augumented it with gap and power blocking. That’s how the Baltimore Ravens did things when Hue Jackson was quarterbacks coach, and the Raiders have borrowed heavily from offensive coordinator Cam Cameron’s offense. While we’ll have to wait and find out if the Raiders are better, they’re certainly bigger up front, making them in theory more adept at converting near the goal line with a straight ahead push. Langston Walker, the right tackle and replacement for Cornell Green, would not be a starter in a strict zone system. The Raiders went for a bigger center in Jared Veldheer, some six inches taller and 15 to 20 pounds heavier than Samson Satele. Chris Morris, a zone blocking center and guard dating back to his days at Michigan State, was released. Daniel Loper, a bear of a man at 6-foot-6 and 320 pounds, was kept instead. When the Raiders signed defensive end Jay Alford Wednesday, the player cut was Erik Pears, an angular tackle schooled in the zone system in Denver. Khalif Barnes, bigger and stronger than Pears, becomes the primary backup at right tackle as well as left tackle. Left guard Mario Henderson and left guard Robert Gallery are big enough and powerful enough to handle either scheme, although Henderson’s consistency remains an issue. The remaining starter with a predominantly zone background is Cooper Carlisle, who for the time being is holding off Bruce Campbell, the fourth-round project who may not be ready to play until much later this season, if at all, as a rookie. The moves have been just as decisive on defense. Middle linebacker Kirk Morrison was traded to Jacksonville, and four-year starter Thomas Howard is been brought back as a reserve and special teams players, both men saddled with the reputation of being not stout enough against the run. The crew of linebackers is entirely new and much bigger _ strong side starter Kamerion Wimbley and middle linebacker Rolando McClain are listed at 255 pounds, and new weak side starter Quentin Groves is a converted end who weighs 265. On the defensive line, Richard Seymour moved from end to tackle and to date hasn’t played nearly the percentage of snaps outside. John Henderson, at 335 pounds, signed as an free agent after being released by Jacksonville although it’s not clear how much he’ll play. Tommy Kelly is lighter at 315 pounds, but ostensibly stronger. About the only against-the-grain decision of late was moving Trevor Scott from linebacker to defensive end, displacing Matt Shaughnessy, who outweighs him by 15 pounds. Shaughnessy will play plenty in a rotation basis, and it remains to be seen if Scott, listed as the starter, will actually be playing on running downs instead of being a nickel rusher along with Wimbley. The Raiders set a goal to become bigger and stronger to address areas of need and executed it during the offseason. Now comes the big step _ executing it on Sundays. Now if we can just get Bush healthy. Lane Kiffin is running the same boring offense he did when he was here. It is the same run run run short pass run run run short pass. USC is in trouble, Kiffin and his (2 score Lead) we should win offense. Just enough points to lose by an inch. Al: hi, tom. It’s al, upstairs. Look, on the next play, I want jamarcus to throw the ball down the field. The other team will never expect it. Tom: Boss, I hate to tell ya, but jamarcus doesn’t play for us anymore, remember? You let me get rid of him when you were hopped up on centrum silver and maalox. Jason Campbell is the quarterback now. Al: what? You got rid of jamarcus behind my back? He is a great player and you need to get over it! Don’t make me write a derogatory letter, tom! Tom: I was just kidding, Al, big guy. It’s jamarcus down there. He just lost some weight, shrank and learned how to play. Listen, al. I’m not calling another hail Mary. Me and the other coaches would appreciate it if you’d stop calling down here every 30 seconds and just let us do our job, please. Al: I see…. No problem, Tom. I was just trying to help. But hey, if you don’t want a bragzillion years of football acumen at your disposal, I understand. Hey, could you put Hue on the line? Trade DMAC for Norm Chow! KK you’re such an idiot why do you think he hred Hue Jackson to get Shanahan’s system? What system do you think they’d be running Hue is the OC? Are you really dumb enough to think that he doesn’t kmow what system his team is running that he needs an opposing coach to tell him? Soem of you guy’s are so ignorant with all your Al Davis dogma that you can’t see past your own pathetic nose. Dumbell!! Lecture me, when the numbers are other than 29-83. Davis isn’t going to like that. I’m wondering if I give out my secret Bloody-Mary recipe is half this blog will be cocked at half time? Hopefully more than wishful thinking.